Home » Results » Web Design Portfolio » Saratoga Human Resources Solutions, Inc.
As a customized HR firm, Saratoga Human Resources Solutions helps companies of any size build their Human Resources team. With the need expand their website in response to the company’s recent growth, Saratoga HR partnered with Mannix Marketing for a website redesign and SEO services. Saratoga Human Resources Solutions needed a modern website that reflected their staff’s 75 years of combined human resources experience across multiple industries. The new website design features a clean and contemporary layout with a user-friendly navigation bar and prominent call-to-action buttons. By integrating the website redesign with search engine optimization strategies, Saratoga HR Solution’s website was developed to get found on the web for their innovative HR services. Saratoga HR’s new website design is informational and easy-to-read, so visitors have a clear understanding of their now-wider array of HR services and how to contact them. The easy navigation bar clearly displays their services with links to separate web pages for further reading. The new website design offers a click-to-call phone number and three prominent call to actions, “view our services,” ”view our case studies” and “more about us.” These calls-to-action buttons strategically keep visitors engaged and on your website, creating multiple opportunities for converting website visitors into leads. 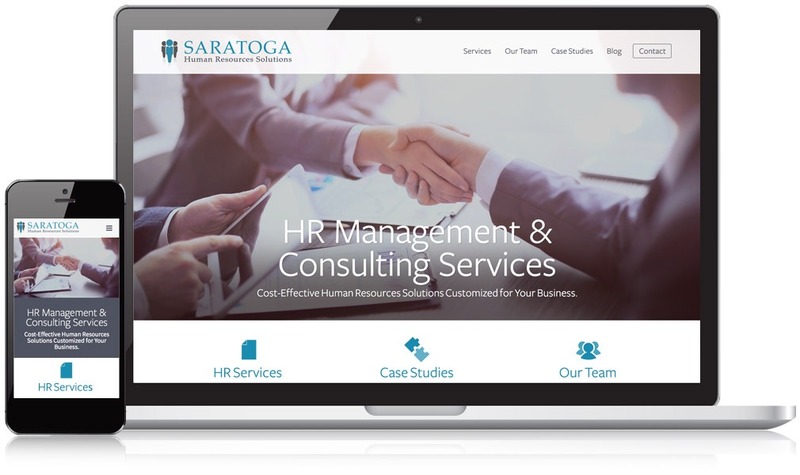 Our website design included separate webpages so Saratoga HR could increase their content and show off their knowledge as titans of the HR industry. 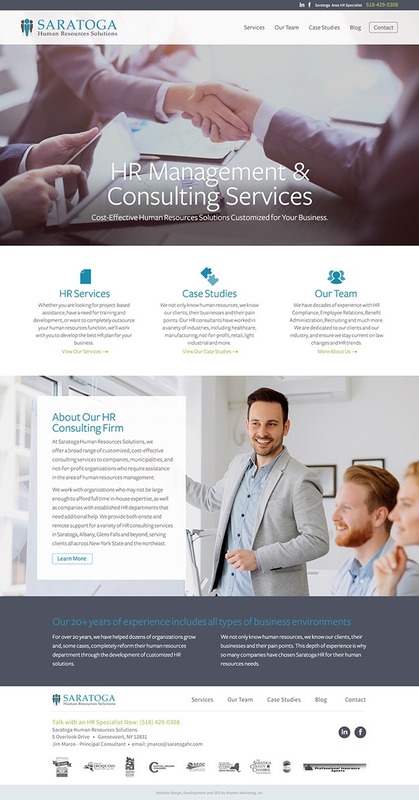 Unlike their previous website, the new design showcases their proprietary HR case studies for healthcare, non-profits, nursing facilities, and both large and small businesses. By promoting this content front and center, it sets Saratoga HR up as industry experts and educates potential clients on the unique solutions they can provide. Since their website launched, Saratoga Human Resources Solutions has had more website visitors who stay longer and view more pages, resulting in a 50% increase in sales. Need a Human Resources Website Design to showcase your company’s skills?